Countries outside of America often identified their fine china with hallmarks that included crown images along with other symbols typically associated with royalty. Some of these marks -- dating from the beginning of the 18th century -- are still used today by certain manufacturers. The crown is usually only part of the hallmark, as it may also contain the country of origin, especially after the 1891 Tariff Act. To identify the companies that used hallmarks containing crowns, obtain a reference book of crown hallmarks or compare the mark on your fine china with pictures from online databases. The underside of this fine china cup could hold important information.
. The hallmark establishes the company who made the china and sometimes even the year that the china was produced. Some pottery companies changed the hallmark slightly with each new product line or included pattern names, country of origin, artist's initials or other identifiers that can help you identify the manufacturer. For example, Royal Albert, Staffordshire, Derby and more are all manufacturers that used crowns in their backstamps. The Stafffordshire crown resembles the English crown worn by the monarchy with the company's name beneath the crown. 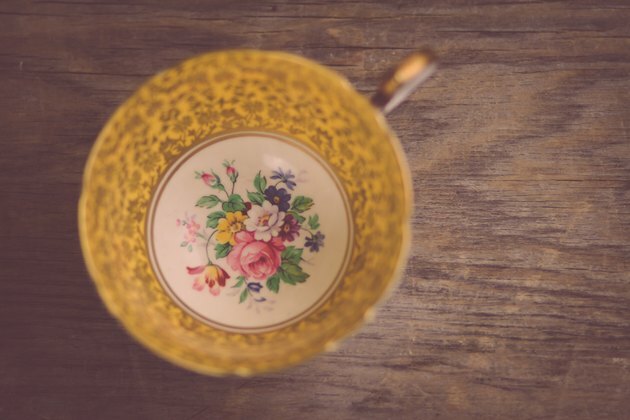 Great Britain, France, Germany and Italy were all countries that had manufacturers who added crowns to the identifying hallmarks on the underside of china plates, saucers and cups. All these crown hallmarks contain different crowns and other symbols. The symbols may just be a letter, crossed swords, lions, unicorns, bundles of wheat and other forms. The crown symbols and hallmarks are individually designed and different for each china manufacturer. Many collectors and appraisers maintain databases that depict the various hallmarks used throughout the centuries for fine china. Visit these experts with a picture of the crown hallmark on the underside of your fine china to help identify the company and the year of manufacture. Hallmarks were often updated for each successive year, or they may include other identifiers for establishing the age of the china, such as numbers or a series of letters with numbers associated by hallmark charts with specific years. Companies that sell replacements for missing pieces of china sets also maintain extensive databases and sometimes offer hallmark or china pattern identification free of charge or for a modest fee via an image you send them. Some of these sites also provide online databases that include pictures of hallmarks to help you identify the manufacturer's individual hallmarks. Take pictures of the hallmarks you have found on your china to compare them to pictures online or in reference books.